They're calling it a demo, not a game, and it's not quite perfect. You can't even walk in it, after all. But there's something really cool about the London Heist, a snippet of a first-person shooter made to be played using Sony's PlayStation 4 Morpheus virtual reality headset. I know that telling you much about this is largely pointless. Virtual reality, like the 3DS' glasses-free stereoscopic gaming before it, is something you need to see to judge. Virtual reality's tough because the best I can do is show you postcards and write you some words. You've really got to be there yourself. Nevertheless, let's try. Shipping in early 2016. No price, but you can guess it'll be somewhere in the ballpark of $expensive. Think about putting that on your head. Congrats. You're a member of the gaming press at the 2015 Game Developers Conference. You're about to play a VR shooter. You take a seat. And a bruiser of a guy starts talking to you. Note that for this demo you'll be holding two PlayStation Move controllers which, like the Morpheus, are being tracked in space by a camera sensor. Here's more of a direct-feed look at the bruiser guy, who has a blowtorch out because he is planning on torturing you. I played this, and this shot here just doesn't do justice to the experience. You're sitting. Your front field of view and some of your peripheral vision—along with the headphones you're wearing—pretty much place you in the sewer/basement/wherever that you're virtually sitting in. You are in the room with this man, and having even a virtual guy get up in your face is surprisingly uncomfortable. You can look around while he threatens you. At one point, when you look at him, he flicks his cigarette in your face. Then the demo switches and you're behind a desk. Unpleasant people will be arriving soon to shoot you, so you need to start reaching for some drawer handles to open the desk up and find a gun. This is a so-so part of the demo. Your hand movement is supposed to directly control that of the virtual hands, but the lack of physical feedback is a little weird. There's some good tension, though, as you try each drawer while the guys are getting closer and closer. You get the hang of it, and are soon opening little hatches, turning a key, finding a pistol, using your other hand to put a clip in the pistol. You studied the controls, right? By this time, enemy dudes are rushing on. You need to shoot at them. Extend that arm and fire away! You see that hand floating in the middle of the screen right there, right? If you're like me, you don't immediately realize that there are guys on the balcony. If you're like Matt, you duck for cover and then shoot! He even changed his shooting hand. He's good. Kill the guys, and the demo ends. Stepping back... if you were just some good-hearted person reading this demo, you might be like, "Yeah, whatever, I might buy a Morpheus if they make a God of War for it, but I don't own two Moves and, really, don't we need an analog stick here to move around? And do I want a game where I have to start by sitting on a chair and then have to depend on someone else pulling the chair away so I don't fall on it when the shooting and ducking starts?" You would be raising some valid points if you said those things. Now, if you actually played the demo, I think you'd be impressed. You might say, "Hey, this might be an impressive, fun, gimmicky tech demo or it might be the foundation for a satisfying immersive shooter. I'm not sure, but I'm glad people are making crazy stuff like this. I hope I can afford all the gear I'd need for it." Sony is talking more about Morpheus this week, because they want the thousands of developers at GDC to make games for it. The sooner they show some deeper, more substantial VR games, the better. 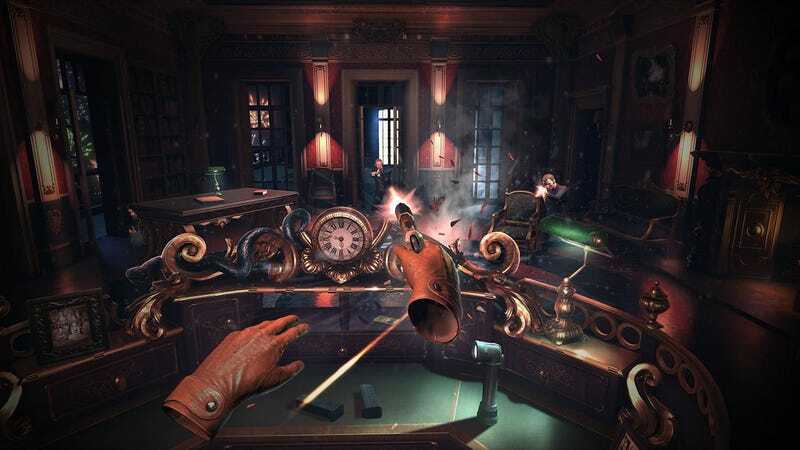 London Heist was, at least, an interesting tease of the PS4's potential VR future.